Whether you are single or you have a family, one thing is for certain, you like to be entertained when you are at home. While your computer, television, and video game systems can provide you with the entertainment that you need, there are other sources of entertainment available as well that are much more active. One great choice for adding some entertainment to your home is to purchase a table game such as a pool table, air hockey table, ping pong table, or even better, a foosball table. Many of the other table games take up a lot of space that you likely do not have. This is why a great foosball table is a good option for almost every home. 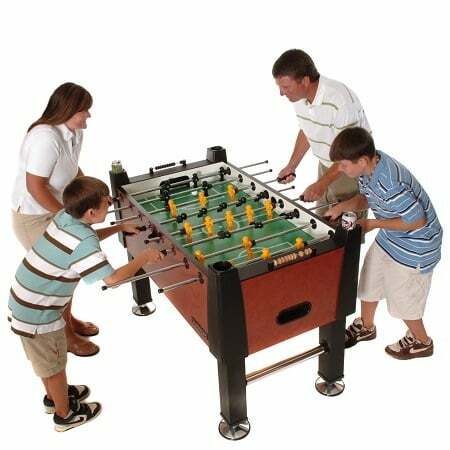 Foosball tables come in a number of different sizes and provide hours of entertainment. If you are looking for a foosball table for your home you have come to the right place. This review is about the Carrom Signature 55 inch Foosball table. This is a standard sized table that has a lot to offer. The following review is based on a thorough evaluation of the features and capabilities of this foosball table and hopefully it will help you make an informed decision about purchasing it for your home use. There are numerous foosball tables that are priced higher than this one that do not come with counterbalanced players. This is perhaps one of the best features of this particular foosball table as it features counterbalanced players. This is a great feature for intermediate and advanced players as it allows the men on the game table to be placed horizontally. This increases the amount of space that can be used for shots. In addition, players are given more control over their rods. The weight of the table in combination with the one inch thick cabinet will provide stability throughout game play. Even if the game becomes aggressive, this table is going to stay in place. In addition, this table has a ⅜ inch thick surface, leg supports, and levelers all which help to provide a good playing surface. The rods are made from a hollow steel and are extremely smooth and light. These rods were made to last and will provide fast play, which is something that your intermediate and more advanced players are looking for. The handles are made from an all natural wood and have been designed with control, comfort, and style in mind. The ball return is located on the ends, instead of the sides, which makes retrieval a bit inconvenient. This foosball table is available in 3 colors, Moroccan, Agean Fresco, and Burr Oak. This is a neat feature as most tables only offer one color option. The different colors allow you to choose a table that will best fit into your game room design. Who Is This Table For? The Carrom Signature is great for beginners, intermediate players, and even some advanced players will enjoy this table. It is ideal for teenagers and adults. The counterbalanced men combined with the hollow rods make this a good choice for intermediate players, but this table would also be great to learn on. When it comes to making a purchase such as this there are always going to be pros and cons to weigh. Let’s first look at the positives of this particular table. Now let’s look at some of the negative aspects of this table. Bearing placement is poor: the bearings are placed between the rods and holes and there is too much space in this area, which can affect the smoothness of the game play. Assembly time: you are going to need at least a couple of hours and a minimum of 2 people in order to set the table up. Assembling the table is a bit difficult, but there is a YouTube video available to help you through the process. There are currently 55 customer reviews of this table on Amazon. Most of the reviews are quite positive, but there have been a few complaints about product defects. The overall consensus among consumers is that this is a sturdy and attractive table that is fun to play on. The rods are smooth and it is reported that the company offers quality customer service. The biggest concerns are that there are some dead spots on the table and the instructions for putting it together could be improved. 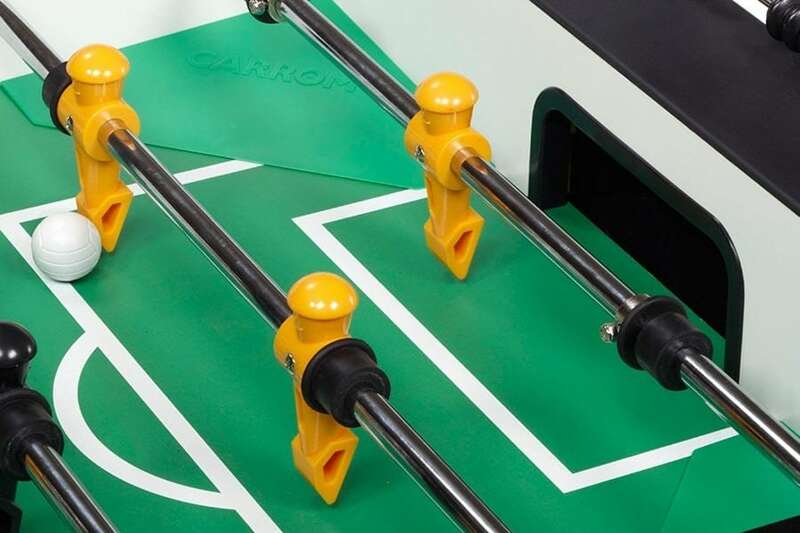 This foosball table from Carrom is not a premium or professional table, but it is a great choice for recreational players. The table has many high quality features and is made in the United States, which proves that it is of high quality. Since this is not a professional level table there are some features such as the leveling mechanism and the counterbalance may be a bit disappointing for advanced players. Overall, this foosball table has a lot to offer. It provides a combination of beauty, balance, and performance. It is really the perfect table for casual players who want to add a bit of excitement to their game room. 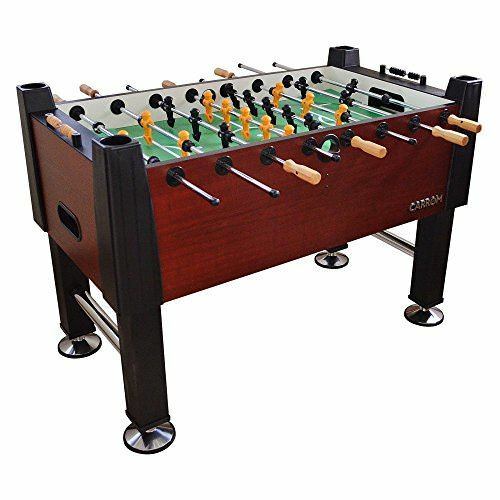 It comes with 2 sets of players, a wide playing space, and sturdy controls offering the feeling of a high end table without the extra costs, which makes it a good choice for almost any household that has the room for this larger foosball table.